1- Do you have any pictures of excess algae? 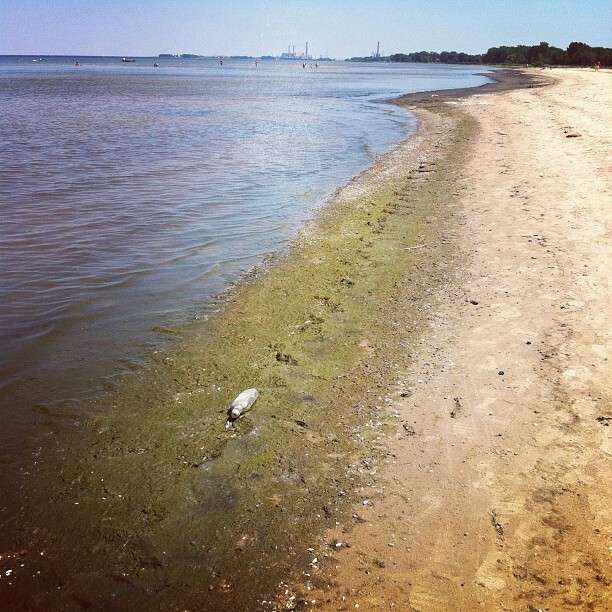 Saginaw Bay muck. Credit: Jeff Kart. It’s also called muck, and you can often find it along the shores of Saginaw Bay, Lake Erie, and other parts of the Great Lakes. Circle of Blue is collecting photos of the Great Lakes and algal blooms. The idea is to make the issue real and visible to people around the world. The online news site plans to launch a major story project this year about algal blooms in the Great Lakes. The project will be circulated far and wide, organizers say. Pictures, and videos, are being sought of harmful algal blooms, failing municipal water treatment systems and overflows, agricultural runoff, and beach closings. All of these have been a problem at one time or another in the Saginaw Bay region. Circle of Blue reports on water, food and energy around the world. It’s based in Traverse City, Michigan. 2 – Michigan is one of only three states in the nation to be selected for a Clean Energy Manufacturing Roadmap project. The Roadmap will be developed for Michigan with $400,000 in federal funds, matched by more than $300,000 in local funds. North Carolina and Washington state also received funding, according to the U.S. Department of Energy. The awards are in support of a national goal of doubling energy productivity by 2030, and are aimed at advancing clean energy manufacturing in the states. Michigan, and the two other states, will develop roadmaps to increase clean energy manufacturing activity in their regions. As part of this, the Michigan and Ohio State energy offices will convene stakeholder, company and expert events to identify opportunities and barriers. 3 – If you want to keep Asian carp out of the Great Lakes, a pen may come in handy. Or, more likely, a computer keyboard. A U.S. Army Corps of Engineers report released this week lays out the federal government’s options for keeping Asian carp and other invasive species out of Great Lakes. It’s called the Great Lakes-Mississippi River Interbasin Study, and includes eight options that focus on the Chicago Area Waterway System. The Corps. is holding public meetings around the basin this month to receive public comments on the options, which include physical separation of the Great Lakes and Mississippi River basins. Public meetings are planned for Ann Arbor and Traverse City. But, you also can submit written comments until March 3 online at the study website.